This paper focuses on two specific issues in the design of a domestic cap and trade program for GHGs � whether the cap should be located upstream or downstream, and whether trading alone will suffice to achieve the desired reduction in GHGs or will need to be supplemented with additional regulatory measures. The paper argues for a downstream cap accompanied by measures such as a renewable portfolio standard, efficiency standards for vehicles, appliances and buildings, and a low carbon fuel standard. For this argument, it is necessary to address both the theory and the empirical evidence of emission trading. After reviewing the theory, the paper examines the actual experience in the U.S. with emission trading for SO2, to see whether the assumptions used in the theory actually applied in practice. What actually happened deviated in several important respects from what was supposed to happen according to the conventional theorizing. The design of a cap and trade program for GHG is then discussed, first considering the similarities between the past regulation of air pollutants and the challenge posed by GHGs, and then making the case for a downstream cap and complementary policies. 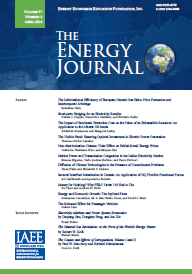 Published in Volume 30, Special Issue #2 of The Quarterly Journal of the IAEE's Energy Economics Education Foundation.